During Ramadan, most of Marrakech is fasting, so at dusk, when stall vendors tuck into their harira – their first meal of the day – there is an eerie silence in the usually bustling souks. This spicy soup is a good way of stretching a small amount of meat between several people. Heat the olive oil in a casserole, add the lamb and brown evenly. Add the onions, celery, garlic and the spices and season. Turn the heat down, cover and cook for 10 minutes until soft, stirring occasionally. Stir in the tomato purée and tomatoes; cook for 2–3 minutes. Add the stock, bring to the boil and simmer for 1 hour, covered, until the lamb is nearly tender. 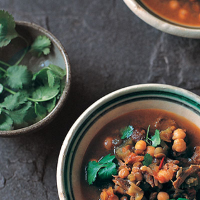 Add the chickpeas and lentils; cook for 40 minutes till they are tender and the lamb can easily be pulled from the bone. Shred the meat, discarding the bone. Add lemon juice to taste, stir in the coriander, and serve. The lamb keynote here is wine-friendly – try an inexpensive rioja.